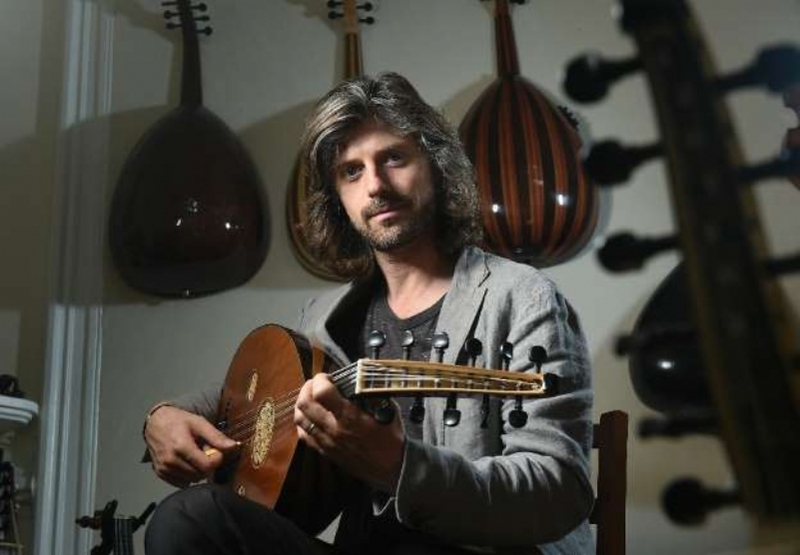 Belgian musician Tristan Driessens found his inspiration and his calling east of the Bosphorus, becoming one of the West's few masters of the oud and of Ottoman classical music. Now he is helping build a musical bridge for others, working with refugees arriving from the east to help preserve and develop their musical culture in European exile AFP reports. "Sometimes you choose your fate, sometimes fate chooses you," Driessens said, explaining how he came to master the oud, the oriental lute, and become artistic director of Refugees for Refugees. This group brings together refugees who have fled to Belgium from Syria, Iraq, Afghanistan and as far as Tibet to play concerts and record new music together in Brussels. A record, named "Amerli" after an Iraqi town besieged by the Islamic State jihadist group, was released in May 2016 by the world music educational association Muziekpublique. A portion of the sales of the recording was invested in two Belgian NGOs working with refugees from the conflicts in the Middle East, Globe Aroma and Synergie 14. Driessens, a 36-year-old Belgian oudist already leads several successful groups: Lamekan Ensemble, Seyir Trio, Soolmaan Quintet and La Compagnie d'Elias. But he did not impose his own vision on the refugee ensemble, trying to draw music from their talents, traditions and life experience, and to guide it towards forming a whole. "There are so many rich personalities," Driessens said. Among the group are Dolma Renqingi, a Tibetan singer, Asad Qizilbash, a Pakistani who plays the sarod, another form of lute, Afghan troubador Aman Yusufi and "musicians who have such important experiences, as refugees and as human beings, in the realm of music". At Muziekpublique, Driessens teaches Turkish music, but he invited his new colleagues to share all "their baggage, their musical tastes and their technique." "From there, I put together a rundown," he explains. "I spot the pearls... to create something of relevance, but for me this group is first and foremost a human adventure." A second Refugees for Refugees album is due out next year. Driessens also owes his musical calling to a journey, albeit not a forced one. Between the ages of 15 and 17, the young oud player roamed Spain with his mother, living and travelling in a gypsy caravan pulled by two horses. There he discovered musical traditions drawn from both the Sephardic Jews and Arab Andalucia. "It shaped how I saw the world and allowed me to meet many artists at a very young age," he said. The oud is often associated with Arabic music, but Driessens' next encounter was with learned Turkish performers, virtuosos like Yurdal Tokcan and Necati Çelik, whom he sees as "a father, an anchor." The young Belgian's formal guitar and piano training had been in the Western tradition, but Turkish classical music would open the door to eastern styles. "The power of expression that can be contained in a simple oriental melody fascinates me," he said. For just over a decade he has made regular pilgrimages to Istanbul, the city on the Bosphorus, bridge between Europe and Asia to sit at the feet of masters. "It's a cord that I can't cut, a second home," he said. "Whether it's to make a recording, attend an artist in residence or just drink Turkish coffee with my master. I was formed in this city." Turkish classical music draws on an oral tradition, sometimes with a written score serving as an aide-memoire to its complex, even arcane, melodies. Driessens did not want to pretend to master it in a few months or even years. "It's a music that is passed from master to disciple," he said, describing long informal sessions with his guides, copying and imitating their playing until the underlying music revealed itself. The music of the Ottoman court has influenced western players since the 15th century. Moldovan prince Dimitrie Cantemir was an adept in the early 18th, a successor to the 17th century Pole Wojciech Bobowski, alias Ali Ufki. Sufi and Dervish influences also fed back into the tradition, which spread throughout the diverse corners of the sultan's empire, and now, with Driessens, the Turkish foundation mixes with other influences. Alongside his work with refugees, he is recording tunes influenced by western European folk melodies and modern jazz with musicians from Armenia, Bulgaria and elsewhere. "I'm not trying to pass myself off as a Turk," Driessens insisted. "I'm Tristan Driessens, born in Belgium to Belgian parents -- but blessed with multiple identities."